We say that every day on WFUV, because it's what drives us — finding new music to share with you. And after many years of welcoming artists from all over the world to FUV, it is still pure joy to share the experience, as we do this autumn with FUV Live 21. Our 21st album contains some of our favorite recent discoveries — Alice Merton, This Is The Kit, and Curtis Harding. It also has songs from artists who were new discoveries to us not so long ago — Nathaniel Rateliff and the Night Sweats, Margo Price, and The Record Company. We've also included longtime FUV faves — Shawn Colvin, Brandi Carlile, and Dawes — who continue to be potent musical forces. Carlile possibly has the song of the year in "The Joke," and our live version from Rockwood really brings the drama of the song to life. Making a great record is hard. You could argue that delivering those songs live and with heart, in stripped-down circumstances, is even harder. The performances that shine through a year's worth of sessions and shows are worthy of celebration. You can watch video of these performances below for a preview. Your support of Public Radio makes music discovery come alive. Thank you for that, and thanks to the artists and their teams for creating the music that makes a difference in our lives. As Iron & Wine's Sam Beam sings in "Call It Dreaming," which you'll find on FUV Live 21, "It's here, where our pieces fall in place." 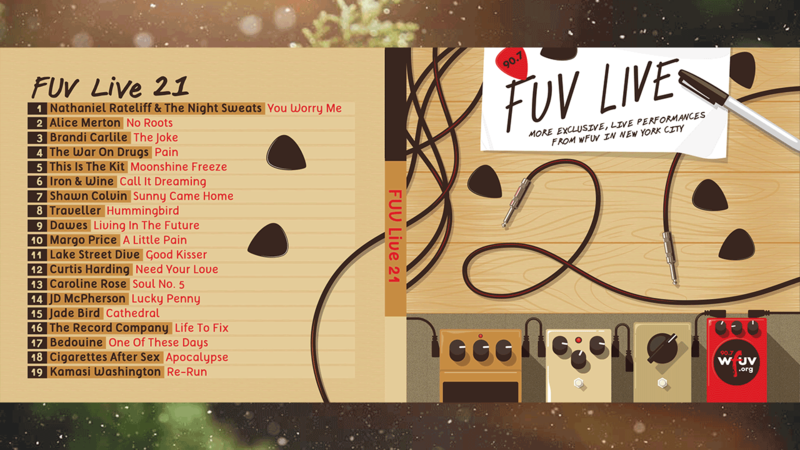 Contribute today and choose this year's FUV Live CD as a thank-you gift.